This is a good memory I have with my mom and since she is no longer alive, I wanted to share it. Celebrating Easter was one of the finer moments of life that I got to live through. Of course, I’m sure it helped the dentist enjoy it more because of all the candy we got. When I was a kid, every Easter morning, my mom would have the Easter bunny show up and leave us these big Easter baskets full of candy. 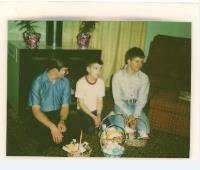 As you can see from the picture in this post, we each had an Easter basket. It wasn’t just a little bit of candy either. These things were pretty heavy. My mom soon learned that if she (opps, the Easter Bunny) got me any hollow Chocolate Easter Bunnies with the eyes in them, they would find them in my dresser drawer months later. I just could never eat those. It always felt like I was eating a real bunny and I could just not do that. The Easter basket thing went until you didn’t come home at Easter anymore. I remember being in college and when I’d come home on the holidays, there a basket would be waiting. I was like, I’m too old for this and she would always say, “you’re never too old in my eyes”. I think she loved being the Easter bunny as much as anything else. It was a moment of joy for her with her kids. Back in those days, that’s when there was great Easter candy, but nowadays the manufacturers have traded profits for memories. The other thing I remember in celebrating Easter with my mom was that we would always get up and go to Easter Sunrise Service. I really did not like getting up that early and listening to a boring preacher give two sermons that day. The part I did like though was normally I got to play the piano for church which I enjoyed. When we came home from Church, there would be this enormous dinner my mom would make and I always loved Easter dinner. No matter how little we might have had, she found a way to make the meal stretch and it wasn’t surprising if someone would have been invited to share the meal with us. Easter is in one of my favorite times of year, Spring! I love spring because everything is coming back to life and new life shows up. It is my favorite moment of the year. I remember when the days would be warming up and Easter was around that time that you could go outside without freezing as much. My mom did a lot of things for us kids. I’m not sure my siblings appreciated it as much at the time. My mom knew how to take a little bit and make it into a lot. She knew how to make a day like this so special that I would remember it many years later.